One of the reasons Matt Keator, the agent for Bruins rookie left wing Blake Wheeler, was so low-key about his client's opportunity in Boston this season was because of the adjustment he was going to have to make. Wheeler was a center who played on an Olympic-sized ice sheet in college, but the Bruins wanted him to play on the off wing and obviously on a much smaller sheet. In most instances, a year in the AHL probably would have been the proper course of action. Wheeler played so well in training camp that he didn't really give the Bruins a choice. He now says the adjustment to the off wing has at times been difficult because he has had to get used to playing the puck on his backhand a lot, but his energy level is way up because of the smaller ice sheet. It has contributed to his overall success. "On the Olympic rink you are skating around quite a bit and there is a lot of rink to cover," Wheeler said. "For me, a lot of my game is getting into the corners and protecting the puck. To not have to go the extra 5-10 feet to get to the net definitely helps a lot. It's a little bit less skating, so it was definitely a good adjustment." Bruins center Marc Savard said Wheeler "looks like a veteran out there." He added that Phil Kessel, a former University of Minnesota teammate, has definitely helped Wheeler's adjustment, but "the sky is the limit for him." MONTREAL -- There were no promises, no expectations. Blake Wheeler was signed, sealed and delivered to the Boston Bruins on a silver platter this summer, but nobody was about to call one of the youngest unrestricted free agents in history an NHL-ready power forward. His own agent, Matt Keator, even told the Boston Globe in June, "This isn't someone who is going to step in and play first line in the NHL. He may have to start in Providence (of the American Hockey League)." Wheeler isn't a first-line player anywhere, but he is a second-liner in Boston with 30 points through 47 games. He hasn't played a game for the Providence Bruins all season, and unless he gets hurt and needs to go on a rehab assignment there's a good chance he never will. "From Matt's perspective, he does a good job of deflecting any expectations and that's how I came into camp. I didn't have any expectations," Wheeler, in town for the NHL YoungStars Game presented by Upper Deck, told NHL.com Thursday. "I just wanted to work as hard as I could and show them what I could do and wherever I belonged I had faith they were going to put me in a place where I could succeed. At the end of the day, they felt I could contribute in Boston. Obviously that was a great situation for me." It's turned out to be a bonanza for the Bruins, too. The Boston Bruins. Wheeler got the monkey off his back quickly by scoring a goal in his first NHL game. The 6-foot-5, 210-pounder has since upped his total to 14 with 16 assists. His plus-27 rating is not just second best on his team behind all-star Marc Savard, it's second best in the entire NHL. Bruins coach Claude Julien, who will lead the Eastern Conference Sunday night, has been playing Wheeler primarily on his off wing. A right-handed shot, he's been on the left wing with center David Krejci and right wing Michael Ryder. "You're seeing a very mature rookie," Bruins General Manager Peter Chiarelli said. "He's adapted to the two-way game very well, which Claude (Julien) demands, and he's adapted from going from the middle to his off wing. All those things, he's handled well and that speaks to his maturity ... if you had asked me if he would have 11 (goals) before Christmas, I would have said no." Wheeler, who is from Robbinsdale, Minn., agrees that maturity has played a big factor in his rookie success. He's 22-years-old and came into the League after three years, 125 games and 96 points at the University of Minnesota. "Looking back at when I was 18 or 19, I don't think there was any way I could have played at this level," Wheeler said. He probably wouldn't have been able to handle the attention he got this summer either. Wheeler was the fifth pick in the 2004 Entry Draft by the Phoenix Coyotes, but he never signed with the desert dogs. He chose to leave college a year early, meaning the Coyotes had 30 days to sign him or risk losing him to free agency, according to the Collective Bargaining Agreement. Instead of signing, Wheeler exercised his right to pick his own team last summer. Reportedly 20 teams were after him and Wheeler admitted, "It was a little bit overwhelming at times. Definitely some anxiety kicked in." But with Keator's guidance he found the Bruins to be a perfect match. They liked how they were developing young players like Krejci, Phil Kessel, Milan Lucic and Mark Stuart. Wheeler, they figured, could fall right in line. "The attention was flattering, but at the same time you don't want to be looked at as the guy who picks out all of the negatives (on certain places)," Wheeler said. "I also needed to do what was in my best interest and my agent did an excellent job of directing me in the right place and showing me where I'd be the best fit. Boston was the best fit for me." Wheeler has not only blossomed into a reliable point producer for the B's, scoring goals in a variety of ways - in front of the net, on the rush, via one-timers, etc. - he has also taken kindly to his role as a key penalty killer. Since Patrice Bergeron and Marco Sturm have gone on injured reserve, Julien has entrusted more shorthanded minutes to Wheeler and Krejci. The two, who have obvious chemistry in 5-on-5 situations, have meshed well together in 4-on-5 as well. 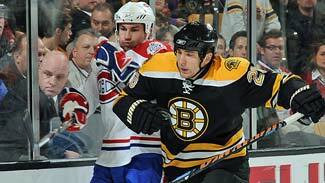 "Every time he's on the ice, he seems to make things happen," Julien said. "He's a smart player. Since training camp, he's been getting more and more confident. He's a good player, he's the real deal, and we've said that all along. That's why we kept him."